For the 9th Marionette, Kilchhofer and Anklin release their collaboration record "Moto Perpetuo". Michael Anklin is a drummer and percussionist based in Switzerland. He’s involved in various bands, collaborations and interdisciplinary projects. 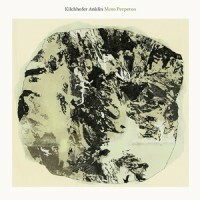 Anklin has previously appeared on a few recordings from Kilchhofer's album "The Book Room". Kilchhofer uses his main instrument - the modular synth - in a more electroacoustic manner, where he derives and processes voltages from Anklin's playing. The album title describes the fascinating idea (yet impossible reality) of a perpetual motion - where no energy is lost yet energy is constantly being created, an endless music, yet far away from generic ambient or minimal music. Anklin's live drumming influences delicate feedback patches on Kilchhofer's synth, where dry and transient heavy percussion and synthesizer sounds erupt into a feral electroacoustic instrument. A fluid concept of time where the rhythmic pulse constantly shifts is at the heart of the record. The idea was to create an instrument where acoustics and electronics are interconnected and dependent on each other. The smallest disturbance could sway the entire system out of order. This idea of a circular motion was at the center of the recording process and is also reflected in the artwork which resembles a topographical view of a closed natural habitat. Well, what can we add to that?! Other than Marionette have consistently beguiled, amazing and bewildered us through their so far modest, nine release catalogue. Lacing modular machinery with a kind of black arts voodoo very few knob tweakers can muster, each artist seems to delve even further into the cauldron; conjuring up a whole host of esoteric soundscapes and evoking the supernatural fauna of the European wilderness at night.